Surgeonfishes and tangs are members of the Acanthuridae family, encompassing approximately 6 genera and 86 species. Surgeonfishes are a commonly kept aquarium species due to their algae eating habits, bold personality and attractive appearance. 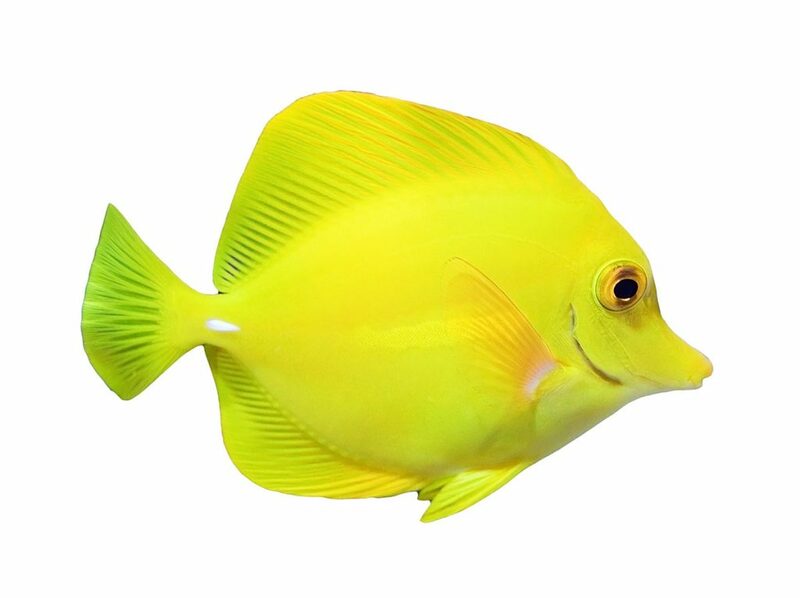 The Yellow Tang (Zebrasoma flasvescens) is one of the most commonly sold surgeonfish species in the marine aquarium hobby. They are brightly colored, attractive and will help eat algae in an aquarium. Other commonly sold species include the Chevron Tang (Ctenochaetus hawaiiensis), Achilles Tang (Acanthurus achilles), Blue Hippo Tang (Paracanthurus hepatus) and the Scopas Tang (Zebrasoma scopas). Surgeonfishes are typically found in shallow waters of the tropical and subtropical oceans. Their diet consists largely of algae, so they are restricted to the depth where algae can be found growing. They can range in size from 6” (15 cm) to 24” (60 cm), with a few species even reaching nearly three feet. Surgeonfish are generally schooling fish that can be found in large shoals, though some species have been known to form pairs. Surgeonfish received their name from the surgeon like scalpel located on their caudle peduncle. This scalpel can be used for defense, or in disputes with other surgeonfish. Surgeonfish can make great aquarium inhabitants, provided their husbandry needs such as diet, water quality and tank space are met. Surgeonfish prefer a temperature range of 72F (22C) to 80F (26C). Surgeonfishes are generally considered very reef safe. In fact, their proclivity for consuming algae in the reef tank has made them very desirable to aquarists for this purpose. It is important to remember however, that the algae growth in an aquarium is not substantial enough to sustain an animal in good health. They still require ample feeding with a balanced diet. It is important to consider carefully what species of surgeonfish may be best for your aquarium. While smaller species such as the Kole Tang (Ctenochaetus strigosus) are suited to tanks as small as 75 gallons, larger species such as the Dussumieri Tang (Acanthurus dussumieri) may be better suited to a larger aquarium.